The SEIU International convention was held in Detroit Michigan and concluded on Tuesday May 24, 2016. NAGE National Executive Board members attended the SEIU Convention as delegates and participated in the election of officers to the International. SEIU members from around the globe traveled to participate in the SEIU Convention for the election of officers, adoption of bylaws and resolutions and to hear the activists and leaders of SEIU talk about the many achievements and campaigns launched and won by SEIU and its members, like the Fight for $15, winning a higher minimum wage for fast food and other low paid workers across the country. At the conclusion of the Convention, SEIU International President, Mary Kay Henry was reelected and NAGE National President, David Holway was reelected as an International Vice President and Executive Board Member to SEIU. While in Detroit, NAGE also held their National Executive Board meeting and election of officers to the National Executive Committee and National Executive Board. Dorianna Medeiros, President of Trial Court Local 458 and Faren Woolery President of MADOT Unit D were both elected as NAGE National Vice Presidents, Manuel Guzman and Steven Zygaj were elected to the NAGE National Executive board. SEIU International President spoke at the NAGE National Executive Board and praised National President David Holway for his leadership on the SEIU International Board and his tremendous support and advocacy for members. 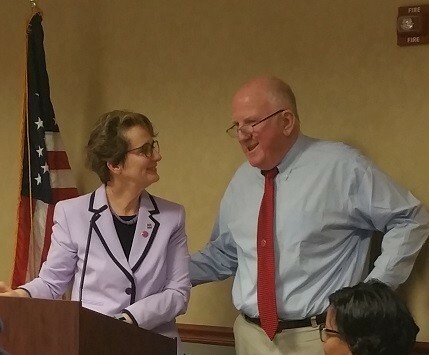 President Holway appointed SEIU President Mary Kay Henry as an honorary NAGE member and presented her with a union card and NAGE jacket. See the video with Mary Kay Henry’s speech at the National Executive Board by clicking on the video below. Presidential candidate Hillary Clinton spoke before the SEIU Convention of several thousand members that included NAGE National Board members and gave a notable speech which we shared on our facebook page. Her speech (link here) focused on the state of America and how organized labor and collective bargaining are good for the middle class. NAGE senior officials are encouraged to begin another year under Mary Kay Henry’s leadership.